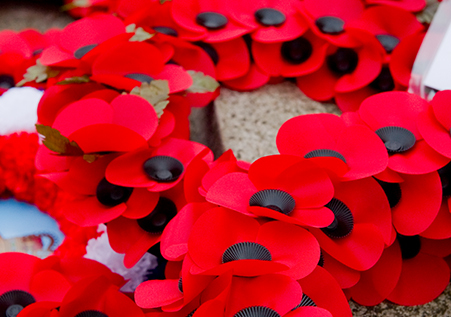 The date for Remembrance Day originates from the fact that on November 11th, at 11 a.m., in 1918, World War One ended. In Canada we celebrate this day in the memory of more than 100,000 Canadian soldiers who died so that we could have peace in the world. In 1915, Lieutenant John McCrae, a WW I medical officer from Guelph, Ontario, wrote the Poem “In Flanders Fields” on a scrap of paper following the death of a fellow soldier. After the poem was published in a magazine, an American teacher named Moina Michael read it and was so inspired by it that she pledged to always wear a poppy as a sign of remembrance. In 1920, a French woman named Madame Guerin learned of the custom. She decided to make and sell poppies to raise money for children in war-torn areas of France. The poppy was officially adopted the Flower of Remembrance on July 5, 1921. Read more about the poppy here. You probably have lots of activities related to this very special day but here are a few that might interest you. The poppy has long been the symbol that represents the importance of remembering those who sacrificed their lives so that we can live in peace (see the Introduction above). Poppies -- Get imaginative with materials to use. For example, cupcake liners or felt circles could work well. Add black centres. Field – Create lots of green grass, with some curled and some straight to suggest the wind blowing. Maybe a picket fence made of several white pickets joined together by white shoelaces? Whatever else you feel would be appropriate! Assemble the mural and sign your class or individual names. As our veterans age, it is sometimes difficult to arrange for someone with wartime experience to visit the classroom and share their stories. If this is not possible in your community, engage the students in a discussion about the importance of Remembrance Day (see Introduction above), and ask them to make thank-you cards for our veterans. What do you think you should say in the thank-you card? What does their sacrifice mean to you? After a rich discussion, invite students to make and decorate their thank-you card. Edit and then send them to their local Legion or Service Club. Once a suitable discussion has ensued about the importance of Remembrance Day, arrange to have the students attend a Remembrance Day Ceremony in your community. Contact your local Legion or Service Club, Town Hall or memorial park and arrange for the students to place a wreath in honour of lost loved ones. Prepare a poem, story or song that could be shared at the event. Perhaps arrange to join the veterans after the ceremony to share stories.